Nearly two-thirds of Americans now support marijuana legalization, and even more in Connecticut, the House passes a bill increasing funding for drug interdiction, the GAO reports on five years of US drug war spending in Latin America, Afghanistan has a whopping record opium crop, and more. Gallup Poll Has Legalization Support at Record High, Approaching Two-Thirds. A Gallup poll released Wednesday has support for marijuana legalization at a record high 64%, up four points from last year and twice as high as just 17 years ago. The poll also includes another first: For the first time, a majority of Republicans support legalization. Connecticut Poll Has Legalization Support Above 70%. A new Sacred Heart University Institute for Public Policy poll has support for legalization at a whopping 70.6%. That includes both "strongly support" and "somewhat support." Among people under 35, 83.2% wanted to legalize it, and even 73.6% of residents with children in the household were supportive. Legalization should be on the legislative agenda next year. Washington State Marijuana Sales Top $1 Billion Mark This Year. By the end of September, retail marijuana sales topped $1.1 billion, according to data released by the State Liquor and Cannabis Board. That's just short of Colorado's figure of $1.118 billion so far this year. Bill Would Create Federal Task Force to Fight Fentanyl and Heroin. US Reps. Katherine Clark (D-MA) and Evan Jenkins (R-VA) filed HR 4090, the Fentanyl and Heroin Task Force Act, on Monday. The bill would create a multi-agency task force including members of Customs and Border Protection, the Drug Enforcement Agency, the FBI, Immigration and Customs Enforcement's Homeland Security Investigations, the IRS, the International Trade Administration, the Office of National Drug Control Policy and the US Postal Inspection Service. The task force would coordinate federal efforts to go after fentanyl trafficking groups and identify the sources of heroin and fentanyl production and distribution. The bill has been referred to the House Judiciary Committee. House Passes Bill to Beef Up Customs, Border Patrol to Wage Drug War. The House voted 412-3 to approve HR 2142, the INTERDICT Act. The bill appropriates funds to pay for new screening devices, laboratory equipment, facilities, and personnel needed to enforce prohibition against fentanyl and other synthetic opioids. A companion measure in the Senate hasn't moved yet. GAO Report: US Spent $39 Billion Fighting Drugs in Western Hemisphere in Five Years. Between 2010 and 2015, US agencies implementing the National Drug Control Strategy spent $39 billion trying to block the flow of drugs from Latin America into the United States. That includes the Defense Department, Homeland Security's ICE, Homeland Security's CBP, the Coast Guard, the Justice Department's DEA and Organized Crime Drug Enforcement Task Forces, the State Department, and the Agency for International Development. Given the huge drug flows from south of the border, it doesn't seem to be working that well. State Department Wants Stronger Anti-Drug Efforts from Mexico. A day after the DEA identified Mexican drug trafficking groups as the key criminal threat in drug enforcement, Deputy Secretary of State John Sullivan told a business meeting in Mexico that Mexico needed to do more to help. "More rigorous, collaborative efforts to confront the threat posed by the production and distribution of heroin and fentanyl are a priority for the United States," Sullivan said in remarks reported by ABC News. 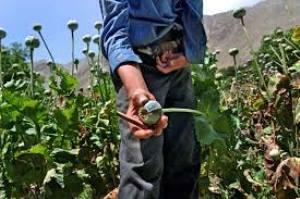 Afghanistan Has Record Opium Harvest This Year. The opium poppy crop this year is a record and more than double last year's crop, according to Afghan Counter-Narcotics Minister Salamt Azimi. He blamed high levels of insurgency for preventing eradication programs from operating. Last year's crop was estimated at 4,700 tons, but this year's will likely exceed 10,000 tons. With both the Taliban, the local government officials, the police and the amy people all profiting from opium production in Helmand, what can we expect from any nominal counter narcotics effort except failure and continued increases in opium cultivaion? ?